Although black powder or gunpowder had been used in safe-blowing until around the turn of the last century, its original purpose was that of a propellant for ordnance. Unconfined it burns freely without detonating and therefore has to be well packed and tamped to allow the necessary build up of pressure of the expanding gases before detonation takes place. Prior to the invention of the blasting cap to detonate the charge, it was an extremely hazardous profession to be a shotfirer. Much ingenuity was called for in devising slow burning fuses, some being made from connecting straws filled with finely ground black powder, or from paper twists which had been impregnated with wetted gunpowder and then dried. When in 1867 Alfred Nobel patented Dynamite, it sounded the death knell of gunpowder as a blasting agent. He had discovered that by mixing the dangerously sensitive nitroglycerine with kieselguhr, it formed a plastic mass which proved to be much less sensitive to shock. For this reason it had to be initiated by a detonator which provided the degree of shock necessary to detonate the Dynamite. From this came a range of high explosives of varying strengths to suit all purposes from mining to quarrying and demolition. For coal mining the lowest strength was most suitable as it did not fragment the material but rather heaved the face being exposed. The strongest explosives were for use in splitting boulders or cutting metal. At the height of the safe-blowing era between the end of the war and the late 60s, the most commonly used  usually stolen from quarries  were Polar Ammon Gelignite and Polar Ajax, both with a velocity of detonation of 2,500 metres per second. Blasting Gelatine, which fires at almost 8,000 meteres per second, the most powerful of all commercial explosives, had also been stolen but by good fortune never successfully detonated in a safe. Unlike the less powerful gelignites, Blasting Gelatine could detonate by heavy contact, particularly if mixed with an abrasive substance like grit or sand. Polar Ammon on the other hand was often handled with impunity and on occasion has been used as an accelerant when the brazier was slow to catch at brew time! There was a danger however if these ammonium nitrate gelignites passed their sell-by date. They were extremely hygroscopic and for this reason were packed and sealed in waxed paper to keep out any moisture. Should the seal be broken, any water absorbed could expel the nitroglycerine rendering it unsafe. It was mainly for this reason that it was replaced in the 60s by Special Gelatine 80% as illustrated below right. Detonators are much more sensitive to handle than gelignite, particularly at the tip which contains the ultra sensitive base charge. 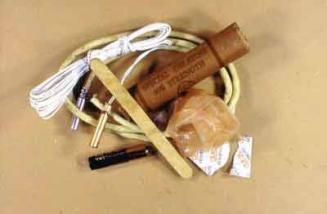 In this photograph of a complete safe-blowers kit are shown the two different types of instantaneous detonators used. The aluminium one is a fused detonator and usually comes complete with fuse attached. When lit, it has a burning speed of 90 seconds a yard, with a tolerance of 10 seconds each way. The copper one has twin leading wires which extend for about 6 feet and which are connected in turn to a more substantial shot-firing cable to whatever safe distance required. A pen-light torch battery is all that is required to fire the detonator at close range. Detonators also come in delay versions, half-second and millisecond delay series. These are used in circumstances where a large amount of material is being blasted and a sequential series of explosions is preferable. They are provided with colour coded leading wires and tagged to denote the actual delay. respecting burglar wants to be found with a balloon in his pocket) is introduced with the tamping stick right through the door gap and into the interior of the lock. Through this is then packed the charge and all held in place with a detonator and some putty (or plasticine  but the same theory as the balloon applies). The other use of the condom was allow the placing of a larger second charge inside the keyway should the first charge have proved unsuccessful. This was a desperate measure as it constituted a bursting charge - the entire door removal with the resultant damage to the contents and property. One other method is known as edge blowing. This requires a knowledge of the safe construction to be worth attempting so does not fall within the scope of this article as it has seldom been practiced in this country. It also requires preparation time and the use of mechanical or thermic aids. This is not to be confused with the standard methods of the safe-blower in the United States who is mostly confronted with round-door money chests fitted with combination locks and punch resistant spindles. The whole point of the circular door is that by hinging it on the central vertical axis the fit is perfect  like a glass stopper in a jar. The only hope then is to exploit any slight mechanical tolerances in the joint and infiltrate liquid nitroglygerine. There are of course still rectangular door safes in use, particularly in the jewellery trade where ring trays have to be more easily stored and accessed, and these have to rely on mass strength of design and material to resist explosive attack.